The cathedral dedicated to St. Francis of Assisi is on the eastern side of the downtown plaza. 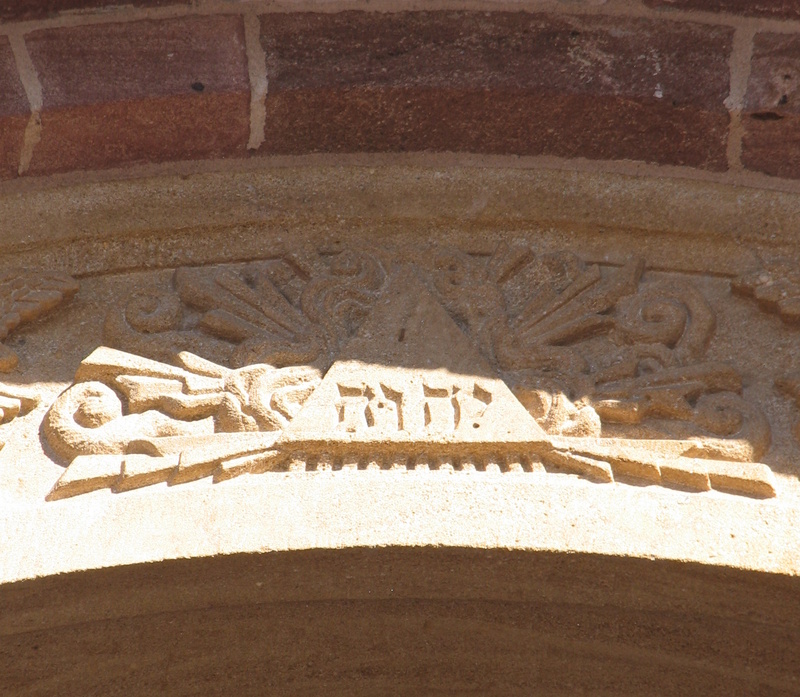 The Hebrew name of God appears over the entrance to the cathedral dedicated to St. Francis of Assisi. Visitors to Santa Fe who enter the cathedral dedicated to St. Francis of Assisi pass under an oddity that has become the stuff of legend: the four-letter Hebrew name of the God of the Israelites enclosed in a triangle. It’s not large and it’s often in shadow, so it’s easy to miss. But those who have noticed it can’t help but wonder what it is doing there. And for every one who asks, there are 10 who will answer—differently. 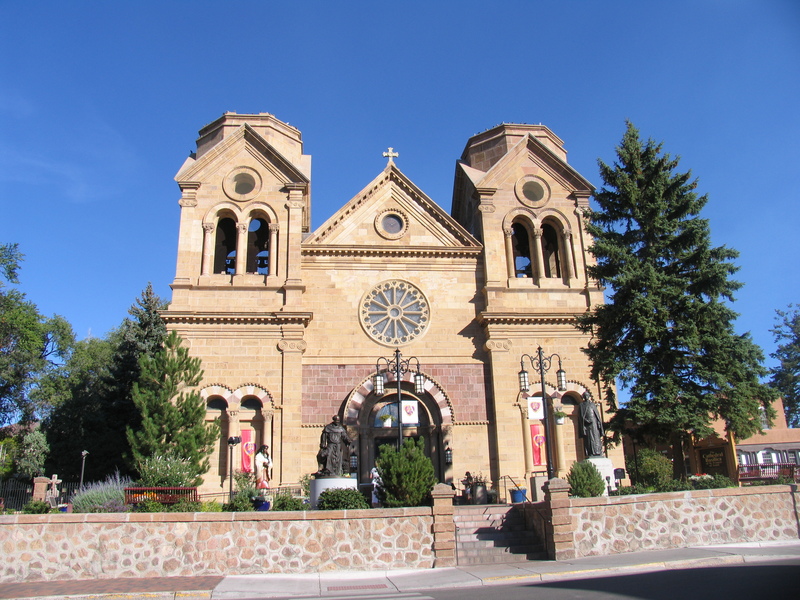 The story begins in 1869 when Jean-Baptiste Lamy, Santa Fe’s first archbishop, laid the cornerstone of the cathedral. But money was tight, and the archbishop struggled to finance the construction. Lamy had well-heeled Jewish friends, merchants who had immigrated from Germany. The French-born Lamy felt a cultural affinity with these former Europeans and they became good friends; he even sent them fruit and flowers on the high holidays, says tour guide Stefanie Beninato. One version of the story is that Lamy attended the merchants’ weekly poker game, though, as archbishop, he did not participate. And when, at one of these games, he mentioned his financial troubles, the players offered to help out. In gratitude, Lamy put their name for God above the entrance to the church. It symbolized harmony between Catholics and Jews. “And it was a good PR move,” Beninato says. Other stories are even better. One is that Abraham Staab, the merchant whose home was just a couple of blocks from the cathedral (and which is today the core of the luxurious La Posada Resort and Spa), lent Lamy a large sum of money and said he would destroy the promissory notes if the archbishop allowed him to add a detail to the exterior without revealing in advance what it would be. The many stories intrigued Floyd S. Fierman, a historian who was rabbi of Temple Mount Sinai in El Paso, Texas, between 1949 and 1979. Fierman’s research, the results of which he published in several places, led him to question the differing accounts. According to Fierman, Abraham Staab’s son, Edward, said that his father did lend the archbishop money and also destroyed the security notes, but that he never agreed to tear up the notes if the archbishop would allow him to have a hand in the design of the cathedral. Fierman found an 1869 newspaper account of the main donors to the cathedral. Prominent among them were the Spiegelbergs, also leading German-Jewish merchants (one of whom built his home across the street from Staab’s), who contributed $500, a very large sum at the time. Surely Lamy was grateful for that. Fierman then tracked down the chasuble and photographed it to show the similarity between the symbol embroidered on it and that carved on the church exterior. Photos and text copyright 2010 by Esther Hecht. Neither the photos nor the text may be reproduced in any form without the express permission of Esther Hecht. According to Genesis, four rivers flow from the Garden of Eden; symbolically, they converge in the mikveh. A new kind of pool in Santa Fe offers a dip in paradise. It is a mikveh, a ritual immersion pool to be used by Jewish women. Housed in a new adobe structure, it is on the property of Rabbi Berel Levertov. 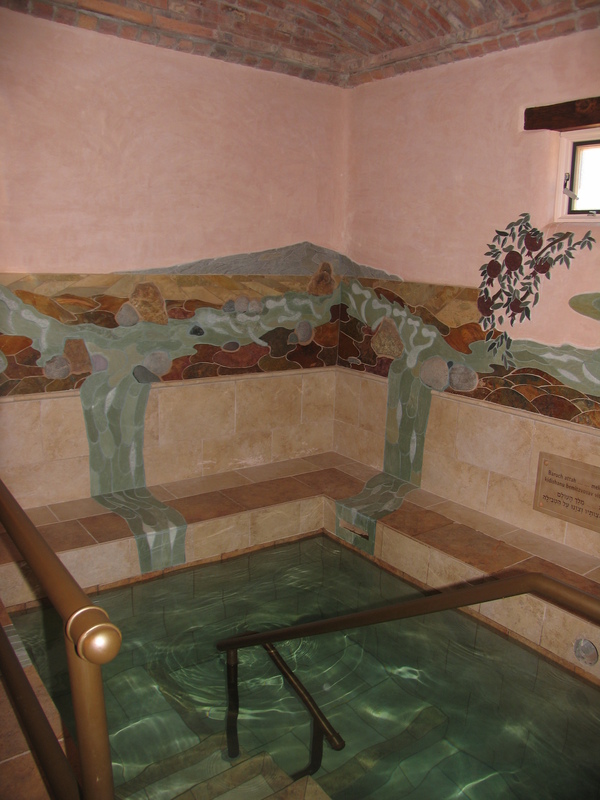 Jewish women use a mikveh mainly to achieve ritual purity after menstruation or childbirth. Brides immerse themselves on the eve of their wedding. And immersion in a mikveh is part of the procedure of conversion to Judaism. In some Jewish communities, women use the mikveh to cleanse themselves spiritually, often at the beginning of a Jewish month. But this mikveh is more than just a pool. The domed brick ceiling has a skylight that fills the room with natural light. And the design on the walls, by local stone-mosaic artist Joshua Kalkstein and titled “Waters of Eden,” consists of 1,400 stones of various natural colors. They depict the four rivers that, according to Genesis, flowed from the Garden of Eden. Symbolically, they flow into the mikveh. Rain water flows from the domed roof into a cistern where it is mixed with a certain proportion of tap water to meet the ritual requirements. During last week’s heavy rain the cistern filled up, the rabbi said. The mikveh is not a bath. Before immersing herself, a woman must cleanse herself thoroughly, and for this there is a separate room with what the rabbi calls a New Mexico shower (squirting water from several directions) and a large tub into which water flows as from a waterfall. Women in search of the cleansing waters of the mikveh will now find that the waters of Eden await them. Photo and text copyright 2010 by Esther Hecht. Neither the photo nor the text may be used by anyone without the express permission of Esther Hecht. Christy Hengst’s birds have come home to roost. Nearly 100 white porcelain birds, each with a different text or image in cobalt blue on its back, have been flying around the world for the past two years. On September 24 and 25 they made their final public appearance in their home town, Santa Fe. “I started working on the birds after the United States invaded Iraq,” said Hengst, 43, as she put the final touches on her installation. On the backs of the earliest of the birds are newspaper clippings about the invasion: Her original intention was to raise the issue of the war in Iraq. But as the project evolved, she added other elements to later birds, such as poetry, a favorite recipe that was her grandmother’s and pictures of her children. The project became an investigation. “The questions posed by the birds are about the humanness of us all, how we are connected, and also the unthinkable ways in which that bond is disregarded,” she explained on her Web site. Hengst created silk screens from photographs and documents and used them to apply the image onto the wet porcelain; she formed the birds while the clay was still flexible and then fired them at a very high temperature. She titled the installation Birds in the Park. And each time the birds alighted on their long journey, she grouped them in varying combinations. They appeared in New York’s Central Park; in Chartres, France, where they roosted in front of the cathedral; and in Peenemünde, Germany, where the V-1 and V-2 missiles were produced and tested during World War II. The choice of Peenemünde was hardly accidental: Hengst’s grandfather was a rocket scientist who worked on developing the deadly missiles there, and her father was a child during the British air raids on the town in 1943 that tried to halt production of the missiles. The farthest Hengst’s birds flew was to the Galapagos Islands. In each location a film crew followed their flight, and Hengst turned still photographs of the birds into postcards. 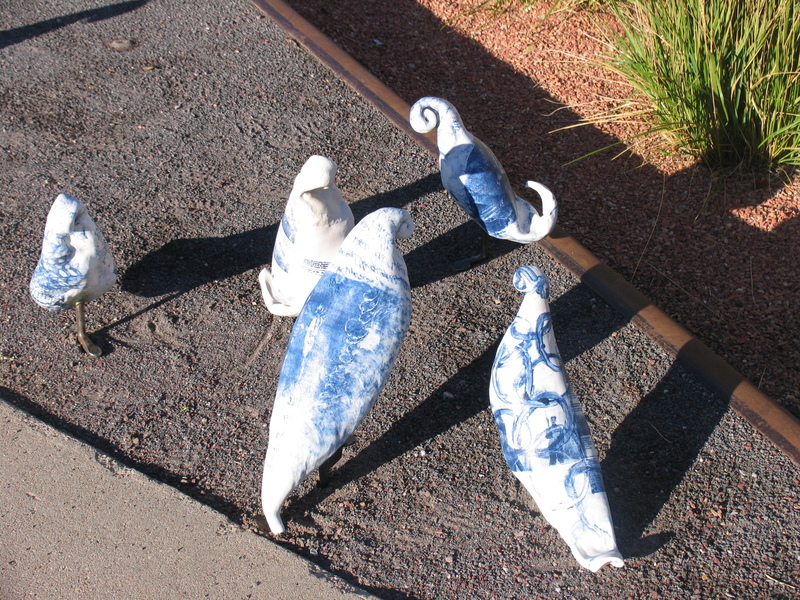 Back in their home town, the birds roosted in a park that is part of the Santa Fe Railyard—a new development that includes excellent art galleries, restaurants and a colorful farmers market. The park itself is a gem that preserves the memory of the railroad, once one of the longest rail systems in the world. The tracks remain, the ties have been turned into benches and two sets of wheels can be seen amid local flowers and grasses. “Follow the bouncing felafel.” That, it seems, is the essence of community. On Yom Kippur I am in Los Angeles and attend services at Temple Isaiah. A huge screen on the bima displays many of the prayers, in Hebrew and in transliteration. All eyes focus on the bima, where the action is, instead of down, in isolation, on the prayerbook. A thousand worshipers become one. Shalom, shalom? It is, as one of the rabbis at Temple Isaiah says, a matter of community. The family that prays together stays together. The people who chant together stand together, at least long enough to release the spirit. Look at the screen and follow the bouncing felafel. After the French Revolution, huge outdoor singalongs were held as part of the process of nation building. In Israel, hundreds of secular people gather to sing songs about building the land—long after the land is so filled the only way to build is up. Hundreds of Hassidim crowd around a rebbe’s tisch, singing and chanting together. Sufi Muslims chant and dance in unison, for hours on end. The repetition may induce a spiritual trance. But it also creates an ad hoc community, one that in the Western world can replace the lost community of the village, the shtetl, the extended family. And it is that sense of community that buoys the spirit, allowing it to rise. Is there a lesson in this for American Jewry? I think so, and Jewish Renewal is learning what the Baptists knew long ago. Chuck the responsive *reading,* perhaps the most boring part of the service, and sing instead. Sing and chant the whole service and let it do what you say your synagogue does: create a community. Perhaps, then, in song, the spirit will soar. Copyright 2010 by Esther Hecht. No part of this text may be used by anyone else without the express permission of the author. A strange dream woke me at 4:30 a.m. in a crummy motel in Grants, New Mexico. I was to have participated in a TV quiz show in which I would be presented with Hebrew idioms and would have to render them in English. But instead of preparing, I worried. Just before the show, I was relieved to learn that the usual MC would not be there and that instead my friend Hana would be the MC. But at the last moment the usual MC showed up, and when the show began he asked me a simple question that stumped me. The Hebrew idiom was “ota g’veret b’shinui aderet.” Of course I knew what it meant, but I was awakened by my inability to find an equivalent idiom in English. I could translate it into Yiddish: Die zelbe dreck mit andere dekoratzie. I could translate it into French: Plus ca change, plus c’est la meme chose. But try as I might, the English escaped me. Then I thought some more and came up with a phrase I liked: It’s old Aunt Tillie in new chantilly. And with that matter taken care of, I could begin to explore Santa Fe. Larry Baca worked in the uranium mines and mills in Grants, on legendary Route 66 in northwestern New Mexico, before he opened a restaurant. El Cafecito, which serves home-cooked New Mexican food, has been going for 28 years. Baca, 52, has just a touch of gray in his cropped black hair and very trim moustache. In fact, everything about him is trim, unlike his customers, whose girth suggests they eat large portions of his cooking at least three times a day. Even Baca’s ideas about life are trim: work hard and play by the rules, that’s what it takes. His own children, however, have imbibed his work ethic and he’s proud of them. Baca’s daughter, a hairdresser, has earned enough in Albuquerque to buy her own house, even though she is bringing up a child on her own. His son is a registered nurse, also in Albuquerque. Neither wants to return to Grants to work or even to visit. The only way Baca can see his grandchild is to drive to Albuquerque, 100 miles east, but he hates the big-city traffic. If Baca has one regret, it is that he does not know Spanish, though he is of Spanish descent. The few words he does know are not enough for him to understand everything his employees say. And, he believes, if you know Spanish you can do anything. As you drive into Grants you see billboards of companies offering to help former uranium miners obtain government compensation—presumably for illness they’ve suffered because of their work. Grants, originally a farming community, has one of the largest uranium reserves in the world, discovered in 1950. But mining stopped there in the 1982-83 recession. Now the town, which had a population of about 9,000 in 2008, is growing, Baca says. That’s partly because of the local coal mine, the hospital and the three prisons. And there is talk that the uranium mines may reopen. But isn’t working in uranium mines dangerous? “Not if you follow the rules,” he says. In his day, workers were warned not to smoke in the mines, but 80 percent of them did. Mill workers were supposed to wear protective clothing. And Baca followed the rules. “I feel fine,” he says, his dark eyes shining. Meanwhile, Baca is putting up a larger building so he can expand his restaurant. And if Grants continues to grow, El Cafecito will always be filled with hungry diners. Octavius, who never told me his last name but who fixed my cell phone, is my new hero. I don’t remember the names of all the people I spoke to at Virgin Mobile over the last five days, but No. 6 was David, No. 7 was Carla, No. 8 was Jules, and No. 9, my hero, was Octavius. I find their names intriguing, because clearly they are on another continent. My guess is that their monikers are pulled out of a hat of Western names. Or perhaps they are assigned by letter: Jawaharlal, you’re now Jules. Darshana, you’re Daisy. Vikram, you’re Victor. It all should have been so simple. All I wanted was to buy minutes for a phone I use only when I’m in the US. I expected to give them my credit card information and get the minutes. It was that simple in the past. But no, there was a PROBLEM. When I first bought the phone, about four years ago, its battery was faulty, so I returned it and got a replacement phone. Every time I came back to the US I bought minutes and got a new phone number. This time, the company informed me that I had never returned the faulty phone. Not only that, they couldn’t find any of the relevant documents. Now if they couldn’t find any documents, picture me, 9,000 miles from home. I certainly didn’t have any. They said, most helpfully, that they would conduct an investigation. Call in Sherlock Holmes, the FBI, the Shin Bet. Dum de dum dum. They said they’d call back in 24 to 72 hours. About three calls from me later, they amended this to 24 to 72 *business* hours. Five calls after that they told me no investigation had even been begun but that the matter needed to be investigated. When I protested, I suddenly found myself with a dead line. Carla, however, in the RMA department (whatever that is) offered hope. She assured me that if I just coughed up seven dollars, the problem would go away. I protested, then paid under protest, and was promised everything would now be all right. A cheerful e-mail message from VM welcomed me and informed me that my new number was good to go. I noticed just one catch: It did not match the number Carla had given me. The first time I tried to use the phone I was told the account could not be validated. The second time the same thing happened. After the third time, I called again. That was when I got Jules, who wanted to start another investigation. At last, along came Octavius on his white horse. The problem, he said, was simple. How could it be simple, I asked in irritation, if the eight people before him had failed to solve it? “Trust me,” he said. And then he proceeded to check the serial number of the phone by talking me through a series of clicks. The moment the serial number appeared on the screen, I understood what the problem was. What was clearly a 5 on the screen was a 6 on the back of the phone, from which I had read off the number to the previous eight people. Octavius sent me a text message as a test, and it worked. Now, is it that Octavius is so smart, or that the rest are so stupid? Either way, I hope that Virgin Mobile shares Octavius’s know-how with his colleagues. And I tip my hat to Octavius, my hero. My husband’s hat was abducted by aliens in Yuma, on the California-Arizona line, just north of the Mexican border. I say aliens in Yuma because you might have thought their shenanigans were restricted to Roswell. The Yuma aliens congregated in the parking lot of Denny’s diner; funny, we didn’t notice them when we went in for lunch. Why they would want my husband’s silly blue denim hat with a zip pocket he never put anything in is beyind me. But abduct it they did, for it was nowhere to be found. He looked in the car, under it, around it. He told me the wind had blown it southward, so I walked south, in 100 degree weather, forgetting my own hat in the car. I searched all over a large unfinished patch of landscaping between the parking lot and busy 16th Street; I searched in the gutter and under all the cars in the lot. Then I told my husband to pull our car back. He inched back and I kept thinking with every turn of the wheels that the hat would appear. It didn’t. We searched so long that the drivers of the two cars parked on either side of us finished their lunch and came out of the diner. I waited patiently for the black Chevy on our southern side to pull back. At last it did. No hat. And then the tiny blue-and-white Cooper on our northern side pulled back and there, just under where its front bumper had been, the hat lay on the pavement. C. B. lost her mind somewhere between Sunset Boulevard and Mulholland Drive. Alzheimer is eating her brain, and each time my husband and I visit her on our annual visits to Los Angeles, some more of it is gone. Two years ago, though she was happy to see us, she spent a lot of our time together talking about people who were visible to her but not to us. Last year, she seemed to know that we were people who were close to her, and she was at once very happy to see us but also terribly agitated, perhaps because she could not dredge up our names or hold a real conversation. This year, perhaps she recognized us, but we could not be sure. She focused only when I started telling her about a camping trip we had planned. But she didn’t focus for long. This woman, who was once such a respected educator and administrator, was expending all her mental and physical energy on fiddling with the elastic band of her trousers, and she was still troubled by the many people she could see and we couldn’t. The mind makes us human, yet we are still human beings when we lose it. Where did C.B.’s mind go when Alzheimer carried it away? I had a watch that thought it was a yo-yo: It kept going back to Switzerland for repair after repair. Watches are not known for running backward, but this one did. It wasn’t a cheap discount-store model, which you might have expected to have some quirks. It was a Movado museum watch, with a black ceramic bracelet and nothing on its black face but a gold dot at the 12 o’clock mark. It was the most beautiful watch on earth, the one luxury item I ever coveted, and in a moment of self-indulgence in 1994 I bought it at an airport shop. Soon after, I went to work one day at 7 a.m. An hour later I glanced at my watch. To my surprise, it was still 7 a.m. An hour after that, it was 6 a.m. At least, that’s what the watch said. I reset it and it worked fine until a few days later, when it pulled the same stunt. The watch had to go back to Movado, which replaced the movement. But at last, 12 years after I’d bought it, I had a watch worthy of its name. And then, just before I landed in Los Angeles Airport on September 15, 2010, I took off the watch to reset it and put it back on my wrist. Half an hour later, I was about to present my passport to the official in the arrivals hall when I saw that my wrist was bare. An American Airlines employee agreed to go back to the plane and look, but she would not let me go with her. I duly filed a lost-item report with the airline, called the airport police’s lost and found, called back the airline. But the watch, no longer a yo-yo, did not come back to me. It was gone, lost in transit. For a brief moment I wondered whether I would buy another Movado. If I could afford to now, I would. Instead, the next day I stopped at the nearest drugstore and bought a $20 jobbie. It’s far from beautiful, but it tells time. Someone else now has the pleasure of wearing the most beautiful watch on earth, and I refuse to mourn.